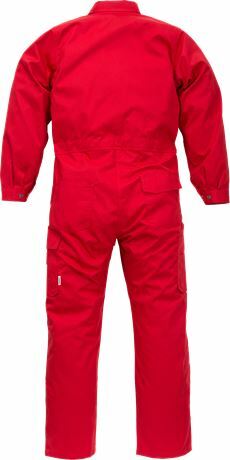 Basic coverall in durable material suitable for industrual work. The colours are aligned with all industry upper parts, making them easy to mix and match. Adjustable waist and cuffs / 2 chest pockets with flap, 1 with pen pocket / 2 front pockets / 2 back pockets, 1 with flap / Leg pocket with inside folding rule pocket over side seam and 3 extra pockets / Leg pocket with flap and outside mobile phone pocket with flap / Knee pocket with outside opening / Height adjustment for knee pads in knee pocket / Triple needle stitching / Leasing laundry tested according to ISO 15797 / Approved according to EN 14404 together with kneepads 124292 / OEKO-TEX® certified.